Slums, shantytowns and camps. These words relay extreme poverty, crowded squalor and unsanitary, often dangerous living conditions. But slums have something to teach us. 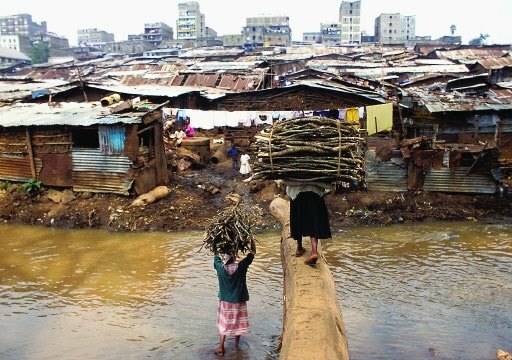 The structures built in slums or shantytowns are constructed almost wholly out of used materials, enabling dwellings to be built cheaply as well as diverting materials from often near-brimming landfills and recycling depots. Architects, sociologists and urban planners are now extracting the positive aspects of slums—the ingenuity and creativity of its residents in using salvaged materials and constructing their own homes—by promoting new “eco-affordable” housing and “junkitecture” movements. 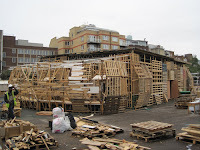 After all, why do structures have to be built using “new” materials? With so much excess in the world, it is surprising that so much cache is still placed on building materials freshly pillaged from the earth—be it wood, glass, steel. 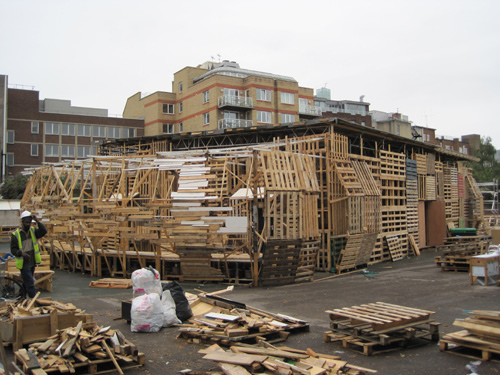 One alternative that is seeing a resurgence in popularity is the concept of creating buildings in part or whole from used materials that would otherwise head to the landfill or recycling bin. The results are environmentally friendly and, often, artistically astonishing! The Jellyfish Theatre produced quite a stir last year in London, and helped popularize the term “junkitecture.” Commissioned by The Red Room, an organization that brings theatre and public art to bear on social issues of our time, and built by architectural husband and wife team Kaltwasser and Kobberling , this theatre was created out of over 800 used wooden pallets from produce markets, 750 sq meters of donated plywood and countless used nails, water jugs and theatre seats.